The myriad cuisines of India all love their vegetables! Veggies are diced and sliced, grated and mashed, stir-fried and curried into hundreds of vegetable dishes. In this series, the A to Z of Indian Vegetables, we take an alphabetical journey through the various avatars of vegetables relished in Indian cuisine. For each letter, we will make a tasty vegetable dish that illustrates one manner in which vegetables are savored in India. A reminder about the X of Indian Vegetables: Next week will be the turn of the letter X. This represents a challenge for this series, and calls for another loophole, I think! In mathematics, the letter X represents an unknown value. X is the letter of mystery, so here is the challenge for X: Choose any fruit or vegetable that is unknown to you...either you have never tasted it, or never cooked with it. Then, use it in any dish of your choice that uses Indian flavors. Here is your chance to scour your grocery store or farmer's market, or go find some exotic ethnic store in your town, and try something fresh and new, do some Xploration! It should be Xciting :) Do you have to take up this challenge for this letter? No, if you come up with something else that fits the X theme, that would be welcome too! The letter W inspired twenty-two wonderful Indian flavors! First, some wholesome W vegetables. Let's start with something bright and fresh. Green leafy vegetables are always welcome in the diet! Here are two delicious recipes using them. TC of The Cooker uses Wild Arugula, a salad vegetable that is much more peppery and flavorful than its cultivated counterpart. The pleasant bitterness of the wild arugula forms a beautiful counterpoint to buttery potatoes in this simple yet tasty Wild Arugula Batata Bhaji. Saju of Chachi's Kitchen highlights two flavorful power foods: Watercress and Walnuts. The walnuts are ground to a tasty chutney with cilantro, then tossed with pasta, the peppery green watercress and tomatoes to make a tempting dish of Watercress, tomato and Walnut Chutney Tagliatelle. Next come Whole White Potatoes, a beloved comfort food for so many of us. Whole potatoes make for a delightful presentation. Suma of Veggie Platter bathes whole fork-tender potatoes in a savory sauce with her party-ready recipe for Whole White Potatoes in Spinach Gravy. The next vegetable is a crunchy and delightful tuber. Water Chestnuts are not well known in most Indian cuisines, but are very popular in other parts of Asia. Unlike most vegetables that soften on cooking, water chestnuts retain a crisp texture even after being cooked. Raaga of The Singing Chef uses them in the simplest and tastiest way: Butter Garlic Water Chestnuts. Live2cook of Live To Cook boldly experiments with the nutty water chestnuts and comes up with two exciting Indian ways to use them: check out her recipes for Water Chestnut Masala and Water Chestnut Mor Koottu. The next vegetable is very much in season right now: pearly and sweet White Corn. Manasi of A Cook At Heart cooks the juicy corn niblets, along with some rice, into an easy and tasty weeknight White Corn Pulav. Linda of Out Of The Garden gets creative...she blends an abunadance of White Vegetables into one Warm and comforting salad. White potatoes, mushrooms, beans and cucumber combine with snow-white yogurt to make one Warm White Salad. We start with a sweet and juicy W fruit that brings welcome relief during the summer months. While the "red part" of the Watermelon is eagerly eaten out of hand, the rind, along with the bland "white part" is often just tossed into the trash. But frugal and creative cooks know that the white of the watermelon, with its bland and crisp taste, can be used as a vegetable. Jai and Bee of Jugalbandi write a beautiful post about the many uses of watermelon rind, and go on to show us how to use the Watermelon Rind, three ways: to make delicious batches of muthia, olan and mor kozhambu. G V Barve of Add Flavor turns the bland watermelon into a lovely fudge: Watermelon Wadi. Next up, we take a break from the sweltering heat to take a look at the Winter Melon. Live2cook of Live To Cook enjoys a wonderful dessert, and years later, she learns to make this memorable Winter Melon Dessert and shares the recipe with us. The next W food is a worthy addition to any diet: Whole Moong, sprouted, are a tasty and nutritious treat. Aarti of Aarti's Corner shares a recipe for a colorful and fresh Whole Moong Salad. Now comes a food that is indigenous to North America: Wild Rice. Wild rice is not really rice, but like rice, it is the edible grain of a grass that grows in the marshy areas near the Northern lakes. Suganya of Tasty Palettes cooks the chewy and nutty wild rice into a gorgeous Wild Rice Pulao. We now come to a W food that is one of the staple foods of the Indian diet: Wheat, often called the "Staff of Life". Different forms of wheat are commonly found in the Indian pantry: broken whole wheat and whole-wheat flour being two popular ways of using this grain. Whole wheat flour forms the basis of some many nourishing Indian flatbreads. Raaga of The Singing Chef shares two tried-and-tested recipes for stuffed breads: the Whole-Wheat Aloo Parathas are stuffed with a savory potato filling and the Whole-Wheat Paneer Parathas have a spicy cheese mixture hidden inside. Priyanka of Lajawaab Ahaar remembers a simple and delicious dish of cracked wheat made by her mother. She uses that time-tested recipe to turn out a Wheat Khichdi with Vegetables: it does look like the ultimate comfort food! Raaga of The Singing Chef uses cracked wheat to make a healthier (and no less tasty) version of the popular dish "upma", with her tempting recipe for Wheat Dalia Upma. Wheat dishes need not be savory...it lends itself to the dessert course as well! Viji of Malabar Ruchi uses wheat flour as the base for a sweet and rich Wheat Halwa: redolent with ghee and studded with fruits and nuts. 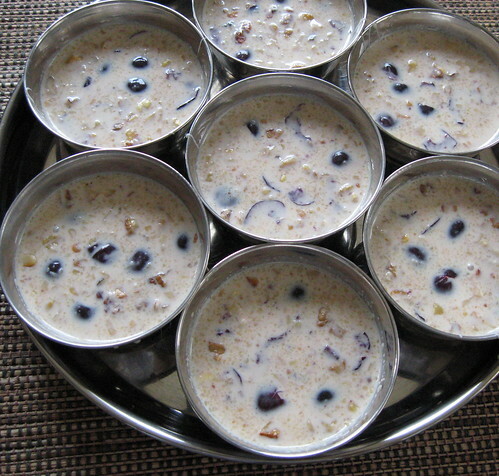 Tee of Bhaatukli provides a detailed step-by-step route to a decadent and creamy Wheat Pudding: brimming with the goodness of milk, coconut, nuts and raisins. The next three entries have something in common. They all rely on a wise way of traditional Indian cooks: of taking advantage of the blazing heat of summer to prepare sun-dried foods that will last all year. One way to store potatoes for the year is to cut them into Wafers and dry them to a crisp in the sun. Aarti of Aarti's Corner gives a simple method for making sun-dried Potato Wafers. Traditionally, potato wafers are deep-fried right before they are served: but these can be microwave-cooked as well! Another sun-dried food that is a pantry staple in the Punjabi kitchen is the Wadi: little cakes of spiced lentils. Once you have these on hand, they can be used to add a tasty protein boost to vegetable dishes. Musical of Musical's Kitchen shares a mouth-watering home-style way with the Wadi: cooking it together with ridge gourd or zucchini into an authentic Wadi Toriyan di Subzi. Asha of Aroma/ Foodie's Hope creatively makes a fusion dish: she adds Wadis to a traditional tangy coconut dish called "ambat" and comes up with a delicious platter of Wadi Ambat. The final dish is a rather whimsical one. Musical of Musical's Kitchen makes a Wagochan...err, she does not make a "wagocha" so much as cook a rustic Punjabi dish that also goes by that name. Confused yet? Read her post to find out more!! The W of Indian vegetables is dedicated to the non-vegetables! The botanical definition of a vegetable, as far as I know, is a rather vague one: it refers in general to the edible parts of a plant. In a culinary sense, we think of vegetables as those parts of a plant that are generally eaten cooked or in savory preparations. Fruits, on the other hand, are usually sweet and can be eaten out of hand. Leaving these vague definitions aside, I merely want to acknowledge that non-vegetables, such as fungi, fruits, nuts and seeds add so much to the variety and taste of countless Indian vegetable dishes. Mushrooms, although not a vegetable at all, have the same properties that we seek in veggies: they are low in fat, have many nutritious properties, and can be cooked into tasty dishes. Fruits such as mango, pineapple, and oh, really all fruits as long as they find themselves in the hands of a capable and creative cook, can take the place of vegetables in a savory dish. Nuts bring a lot to the table too. The addition of nuts to vegetables does much to amplify the taste, texture and richness of the dish. Yes, nuts do add fats and calories, but "good fats" are good for you, and nutty dishes are best served as an occasional festive treat anyway. For the W dishes, I have chosen two that are quick and easy. Or just simply lazy, depending on your point of view! The first is an easy everyday rice dish, and the second is a dessert that takes only minutes to put together. Wild Mushrooms have an earthy, woodsy taste that is simply incomparable. Truly wild mushrooms, those foraged from the wild, are waaayyyy beyond my current culinary scope. They need a thorough knowledge of poisonous and non-poisonous varieties of mushrooms, not to mention someplace wild that you would pick them from! For a city girl like me, "wild" mushrooms are the more exotic varieties- Porcini mushrooms, oyster mushrooms, Chanterelles and the like, that are acquired, rather tamely, from the grocery store or the Farmer's market. In the following recipe, I use the rich stock of mushroom to cook rice in, and the resulting pulao (flavored rice) is a mushroom lover's delight. Minced mushrooms contribute to a flavorful stock while the thick slices of mushrooms are juicy to bite into. Green onions stirred in at the end add a fresh note. In the interest of full disclosure, let me confess that I used only cremini (baby bella) mushrooms for the pulao- wild enough for me! 1. Wash the mushrooms. Cut half of them into a small dice/ mince. Cut half into thick slices. 1. Heat the oil and saute the onion and garlic until fragrant and lightly browned. 2. Stir in the turmeric, red chilli powder and salt. 3. Add the mushrooms, stir around and then cook, covered for 3-4 minutes, until the mushrooms start releasing water. 4. Add 2 cups water to the mushrooms, let it come to a boil. 5. Stir in the rice and garam masala. Cover and cook on low heat until the rice is tender. Turn off the heat and let it sit for 10 minutes. 6. Stir in the green onions and serve hot! I served the mushroom pulao with Anita's Baingan ki Boorani, a rather non-traditional combination which worked *very* well! I knew I had to try this recipe the minute I laid eyes on Anita's post...although I confess that I did bake the eggplant slices (with the turmeric-garlic paste smeared on them, a paste that I made in minutes in a mortar and pestle). 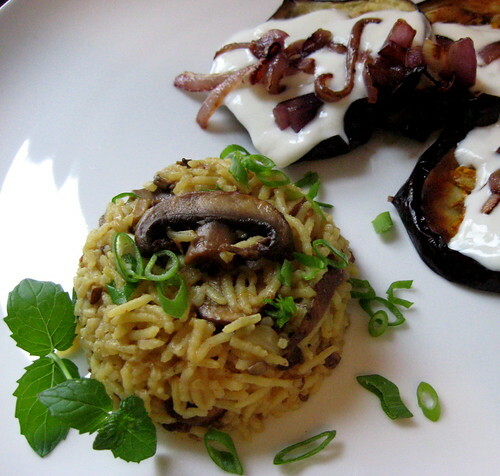 The combination of the flavorful mushroom pulao and the garlicky and creamy eggplant was just exquisite!! Let me say it again: the Baingan ki Boorani is a must-try. Thank you, Anita! Walnuts are such a special treat, they taste great, add contrasting flavor to sweet dishes, and are rich in health benefits.Here, they find their way into a delicious instant kulfi. It is just another version of the Fig Walnut Kulfi that I have posted before. The kulfi base used in the recipe comes from the book Indian Home Cooking by Suvir Saran and Stephanie Lyness. Cherries are in season right now, and the combination of sweet juicy cherries and nutty, bitter walnuts in the creamy kulfi base was just delicious! 1. Toast 1/2 cup walnuts. When cool, break into small bits. 2. Pit and chop cherries to yield 3/4 cup. I used fresh, but frozen cherries could be used too. 3. 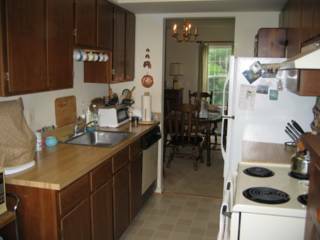 In a large bowl, mix 1 can evaporated milk (low-fat OK), 3/4 can sweetened condensed milk (low-fat OK) and 1 cup heavy cream. 4. To this, add 1 tsp cardamom powder, half the walnuts and half the cherries. Blend together using an immersion blender/ regular blender. 5. Stir in the remaining walnut bits and cherry pieces. 6. Freeze the kulfi mixture for several hours, until solid. You could freeze in a single container, individual molds or popsicle molds. I chose to make kulfi in katoris (small bowls) for individual servings (the picture above shows the mixture ready to go into the freezer). This makes 12 or more servings! Mango Peanut Chutney from AkshayaPatra. I think the wild mushroom pulao and the boorani must have been an excellent pairing. Glad you likes it! All credit to MJ of course. While sad to have missed sending an entry to this one, was blown away by the variety of "W" based dishes! Once again a great round up!!! the wild mushroom puloa looks yummm... nupur. the kulfi looks positively wicked. Yummy Kulfi, Nupur! and love that pulaav with boorani. mushrooms are my favorite too :). Now the "X" factor is tricky, ain't it :-D. but i love your idea of trying new, unknown vegetables (gives me a chance to get adventurous!). Lovely round up as always. Lovely round up!!!! X.. hmmm???? hope I can cook up a recipe with that!!!! Lovely is what I can say Nupur! You have managed to come up with such unique entries. Wow! Love the W recipes -- even though it means that the end of this wonderful alphabet is near. I'll look forward to seeing what the X factor brings! woah!!! this has gotta be my favourite of all your a-z creations yet. Asha, true, you never need to go out for ice cream again! Priyanka, thanks :) glad you like it! Musical, do please get adventurous!! You always do come up with interesting stuff! Lydia, I'm nervous about the X round-up :) let's see how many bloggers take up the challenge! mushroom recipe looks good and loved the round up too. I am a true mushroom fan, so this pulao is a must try for me. Looks really yummy..and I can't express how mouth-watering that kulfi looks..Too good. Like your walnut cherry kulfi. too bad I missed out on my entires for the series due to my vacation. Love LOVE that walnut cherry kulfi. Incredible looking recipe Nupur. What's more I love mushrooms and that recipe is just up my alley. Yummy"! 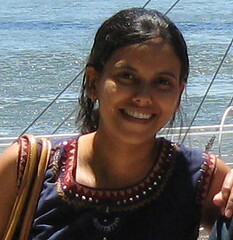 Nupur...You have been tagged ..:). @ http://cooking4allseasons.blogspot.com/2007/07/meme-and-game.html. Play if you have time. This is an excellent round up. All the dishes are nice. The walnut cherry kulfi is too good and I will definitely make it. Even the wild mushroom pulao is looking tasty. Hi Nupur. I have been follwing your blog for a while now. The wild mushroom recipe looks delicious. I am going to have to try it. Thanks for sharing all these wonderful dishes. Prema, glad you like it! Sreelu, hope you are enjoying your vacation! Meeta, I know you are an ice cream fan ;) this one is all about instant gratification...takes minutes to make! Srivalli, I wrote the meme before :) but I enjoyed reading yours! Archana, let me know if you like the kulfi, if you get a chance to try it! Durga, if you use kulfi molds, it will be even better! Oh yeah, look at the clean, clear shots that camera is taking! Pulao looks tasty hon. I need to do some catching up on my writing, we are at W already! It may sound silly but I have a question regarding the kulfi. Is cream a neccessary ingredient here? 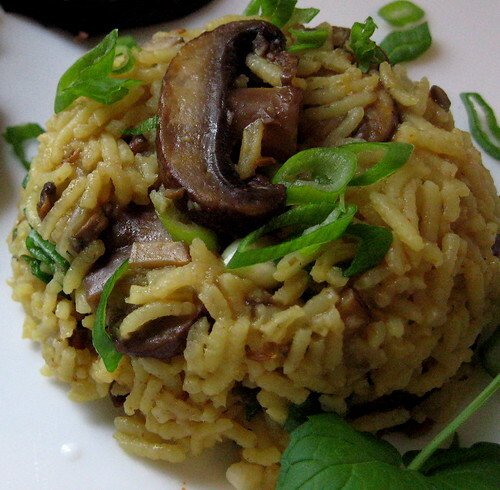 Nupur the mushroom pulao looks moist and mouthwatering. u can use the pic from there, if you wish.